Do you love Eloise? They you'll get a kick out of Ella by Mallory Kasdan. 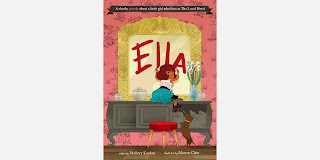 Ella is a modernized version of the charming classic tale. It's about Ella who lives in the Local Hotel and has all the modern trappings and maybe still all of the neglect. She has a manny, she has a manny who is in a band and little dogs you can fit in a purse, etc. The book is a fun and a great modern twist. The illustrations are lovely and vibrant. I can imagine that Ella's world will ignite the imagination of a child in the same way Eloise's did. The book is billed as being for hipsters of all ages, and I think you'll agree. Definitely give it a look! Later this week, I'll have a review for you of HBO's documentary about the illustrator of the Eloise books, Hilary Knight. *Please note I received a copy of this book to review.